Kelly Flynn and her boyfriend, Steve, couldn’t be happier as they await the birth of their bouncing baby boy. Kelly’s got a built-in group of fiber arts specialists, the Lambspun Knitters, who are working away on blankets and booties. As they sit around the table crafting their keepsakes, the story of Giselle Callahan is a popular topic of conversation. DELICIOUS RECIPES AND KNITTING PATTERN INCLUDED! Author Maggie Sefton always does a wonderful job of making her characters feel like friends you know or wish you did. This time around the author shares the joys and daily challenges of impending childbirth through the actions and adventures of Kelly Flynn. The small-town atmosphere and comradery of friendship shines throughout the story. While the story moves at a good pace and is easy to follow, the meat of the mystery isn’t as strong as in prior books in the series. Mystery lovers will still enjoy the challenge of solving the secrets as the story unfolds. A bonus to the story is a tasty recipe, a fun knitting project, and an excerpt from the second book in the knitting series at the end of the story. FTC Full Disclosure – A copy of this book was sent to me by the publisher. However, receiving the complimentary copy did not influence my review. The thoughts are completely my own and given honestly and freely. 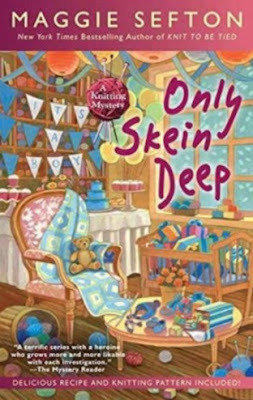 Thanks to the wonderful folks at Penguin Random House, I have a print copy of ONLY SKEIN DEEP by Maggie Sefton to giveaway. The giveaway is open to residents of the U.S. only and will end at 12 a.m. (EST) on Sunday, June 24. To enter the giveaway, just click on the Rafflecopter widget below and follow the instructions. The widget may take a few seconds to load so please be patient. A winner will be selected by the Rafflecopter widget and I’ll send an email with the subject line “Thoughts in Progress Giveaway.” The winner will have 72 hours to reply to the email or another winner will be selected. PLEASE be sure to check your spam folder from time to time after the giveaway ends to make sure the notification email doesn’t end up there. If you win and you’ve already won the book somewhere else or you just decided for whatever reason you don’t want to win (which is fine), once again PLEASE let me know. Thanks so much for stopping by. Do you enjoy a story that gives a lot of day-to-day information about the characters? I love these kinds of books. This is new to me, but I am very interested...I just might ignite a passion for knitting. This series was one of a few that introduced me to cozies! I've read them all and hope that the latest isn't a disappointment At 70+ I'm not much interested in the day-to-day of a new baby. Give me the mystery!! I do enjoy a story that gives a lot of day to day information about a character. For me, it helps bring the character to life. If the day to day stuff is beyond what I experience, sure. This sounds like a good context for the story, Mason. And it reminds me of years ago, when I used to crochet. What a great opportunity to think, or to chat with a friend, etc.. I can see it as a solid background to a story. I have been fond of this author's mysteries for years now. The stories are fun whether the reader is a knitter or not. Oh yes, this sounds fun, thank you for the chance to win a copy! Learning about a character is interesting. Thanks for this lovely feature and giveaway. You've got my attention. Great giveaway. Thanks! I do, as long as it doesn't get too repetitive. I like a bit of the day to day information, it makes things seem real. And that they have a life that is going forward even with the mystery. I don't like it when they never seem to have to go to work or whatever! Cute book.Thanks for the chance.